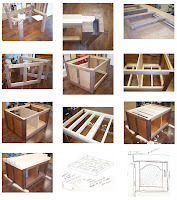 Here are progress pics of the assembly table I started about 2 years ago. It's been waiting for a top and doors since then so is completely sawdust-filled on the inside. The top will be something like a torsion box made of studs (see sketch), which will then be wrapped with a finger-jointed walnut apron. The top itself will be cherry mdf, which will be attached from underneath with brackets so I can replace it if it gets too dinged up. The doors will be tombstone-shaped, frame and panel (see sketch), and attached with invisible hinges. Ultimately, the table will have a face vise and twin-end screw vise, but I'll get back to you in about 2 more years on that. The table will mainly be used for handplaning, as it will stand only about 29" tall, and for assembling larger pieces of furniture. The frame is walnut with 3.5" square legs, while the panels, bottom shelf, and upright support are cherry mdf. At this stage in construction, I'm guessing it weighs about 250 lbs. When finished with top, doors, and vises, it will be more like 400 lbs. I purposely made it heavy, so it wouldn't rack or move under the pressure of handplaning. I pity the poor sucker who has to move it when I'm dead.